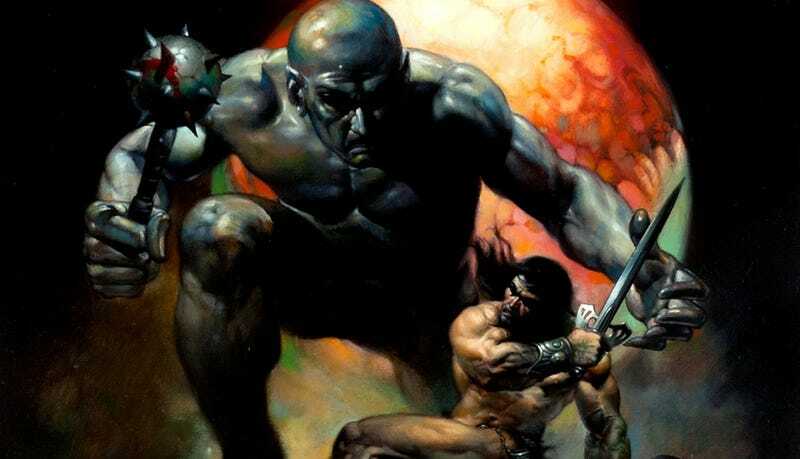 Hardly anybody* ever did sword-and-sorcery art better than Boris Vallejo — complete with beefcake and cheesecake figures in larger-than-life situations. With eye-popping colors and a flair for the dramatic. And now a few newly discovered Vallejo originals are up for auction. My friend's husband died about this time last year, and as she was going through his stuff she discovered he was an avid collector of all kinds of things (they have a big house). She called me up to help, and among the items we discovered were three original paintings by the fantasy artist Boris Vallejo.... After much consideration, she decided to release the paintings for sale this fall, and they are now available on Heritage Auctions. Imagine one of these hanging in your home. There's a third painting, a humor piece depicting Vikings coming to America in 1000 A.D. — but it's pretty NSFW, and also possibly triggering for a lot of people. It's the kind of thing that would have been deemed acceptable in the 1970s, but would not fly today. You can see that third image at the link. * As various people have already pointed out, Frank Frazetta did do it better. Point taken.